I was interested to read on your site that the old church at Grindon ceased to be used in the mid-1800s. I suspect that was when it ceased to be used for religious services. An aged aunty tells me that her father had to walk to the old church from Stillington in the early 1890s to attend sunday school. Does anybody know when the old church's doors were finally closed? The information I have would indicate that no more services were held at Grindon after 1857 although the graveyard continued to be used for family burials for some time after this date. Even by 1834 the condition of the church is reported as being so dilapidated that plans were already in preparation to move the parish church to a new site at Thorpe Thewles. 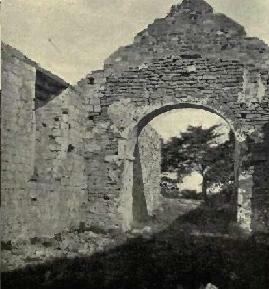 By the end of the 19th century Grindon is understood to have already been a ruin. This is confirmed by a set of photographs published in 1901 to illustrate the visit to the site by the Society of Antiquities of Newcastle (see below). By this date only the basic shell of the church existed. The roof and wall plaster had all disappeared, as had the entire East End wall. 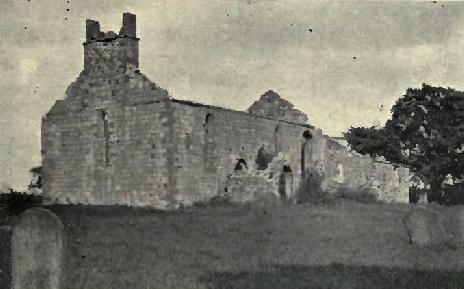 The photos of 1901 would even suggest that by then there was grass growing amongst the fallen stonework inside the chancel. From these photos it would appear that the church must have been in a similar roofless state throughout the 1890s. However, despite this I expect that on a fine Spring or Summers’ morning there would be nothing stopping the ruins of the church being used to hold open air Sunday School classes? Maybe this was what your aunt’s father was doing? From talking to others I understand that by the 1940s the churchyard at Grindon had by then become the venue for at least one local Scout Troop’s Summer camping ground. It must have been a spooky venue for those lads pitching their tents amongst the few gravestones that remained by that date within the churchyard. Better them than me! Thanks for the detailed information Mark. I found my aunty's tale rather strange as by 1890 Stillington had built its own parish church, so why would you make youngsters walk all the way to Grindon? Possibly your aunt's information was passed down from her farther and was relating to a period quite a bit earlier than the 1890s? If we assume your aunt's father was say 10 when he went to this Sunday School would it be possible to work back from his year of death to estimate an approximate period when he remembers attending Gridon Church? I have spoken with my elderly aunt again, and her father was born at Stillington in 1884. His tale of going to Grindon Church was when he was 5 or 6 years old, so that dates the story to 1890. I now have the detail that the vicar who took the Sunday School lesson at Grindon (Rev. Cassidi), also went to the family's home at Stillington for his Sunday dinner, so there was no way that the young boy could duck out of Sunday School. My aunt admits that it is possible that the Stillington children went to Grindon in the summer months, when the lack of a roof on the old church may not have been a problem. But it still sounds a rather strange place to go for a lesson. If we are talking about the 1890s the when the vicar was visiting the family for Sunday lunch must have been the Rev. Henry Boddy as William Cassidi died in 1882. If it really was William Cassidi this would push the time frame back to the early 1880s or before. It’s an interesting story and one worth getting to the bottom of. I don't think this story is any stranger than the one about the scouts camping out in the old churchyard in the 1940s.